Virgin Mobile was looking for a custom YouTube page that would better organize its videos, providing a richer, more comfortable user experience. With a virtual library of great video content, Virgin lacked structure that would help users better find what they needed, whether it be a tutorial for the mobile phone company’s services, phone reviews, event highlights or videos of Virgin’s successful TV ad spots. To better tell the Virgin Mobile story, the Noble team created a custom YouTube template. 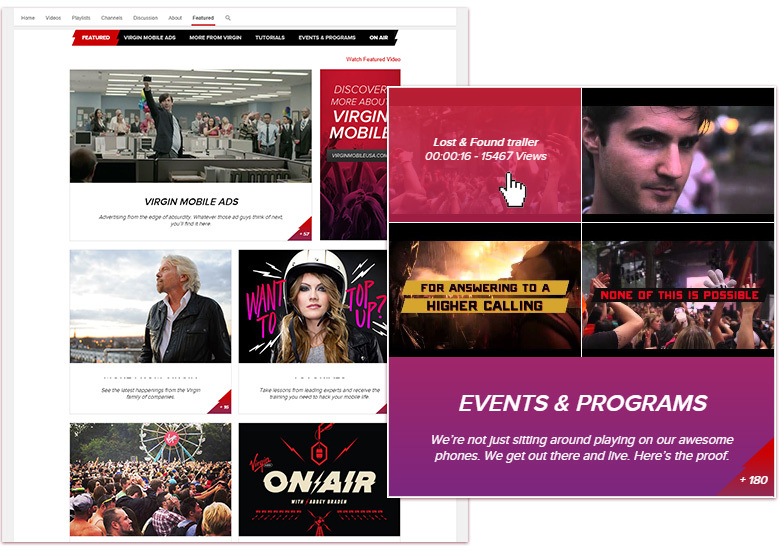 The resulting YouTube page was striking and impactful, featuring a panoramic image of Virgin’s youthful target demographic in stark black and white. Tabs allow users to pick their topic of choice with less visual clutter. Balancing visual elements with a large product line help guide Virgin users to the phones and services they need. YouTube’s platform allows users to share, like and comment on Virgin’s videos. On the home page, a featured video displays below the nav, allowing Virgin to promote deals and products by highlighting the video they want users to see. Noble then grouped Virgin’s videos by topic for easier navigation. Also, now when you hover over a Virgin video, you’re shown a higher level view of all related videos in the same category. Noble added calls to action as well as social bugs to allow Virgin fans interact with the brand on the platforms of their choice. From start to finish, the project only took the Noblebots six weeks.